Skoda's free Roomster upgrade | What Car? 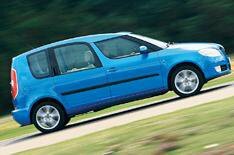 Skoda is offering a free Roomster trim upgrade worth up to 1000 to buyers. Until the end of September, buyers can get a Roomster 2 for the price of the Roomster 1, the Roomster 3 for the price of Roomster 2, or a Roomster Scout for the price of a Roomster 3. Skoda is also offering buyers a finance deal of 6.9% APR for up to 42 months, with a minimum deposit of one months payment in advance. A choice of either free servicing for three years/30,000 miles, or one year's free insurance are also part of the deal. However, we still recommend buyers haggle hard over prices, as deals may be keener if you buy the trim level you want rather than opting for the upgrade.